Walking, or sometimes referred to as "The Wild", is a lecture by Henry David Thoreau first delivered at the Concord Lyceum on April 23, 1851. Written between 1851 and 1860. Thoreau read the piece a total of ten times, more than any other of his lectures. "Walking" was first published as an essay in the Atlantic Monthly after his death in 1862. He considered it one of his seminal works, so much so, that he once wrote of the lecture, "I regard this as a sort of introduction to all that I may write hereafter." Thoreau constantly reworked and revised the piece throughout the 1850s, calling the essay Walking. 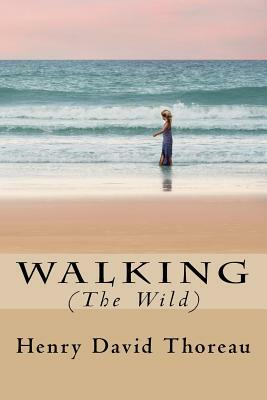 "Walking" is a Transcendental essay in which Thoreau talks about the importance of nature to mankind, and how people cannot survive without nature, physically, mentally, and spiritually, yet we seem to be spending more and more time entrenched by society. For Thoreau walking is a self-reflective spiritual act that occurs only when you are away from society, that allows you to learn about who you are, and find other aspects of yourself that have been chipped away by society. "Walking" is an important cannon in the transcendental movement that would lay the foundation for his best known work, Walden. Along with Ralph Waldo Emerson's Nature, and George Perkins Marsh's Man and Nature, it has become one of the most important essays in the environmental movement. "I derive more of my subsistence from the swamps which surround my native town than from the cultivated gardens in the village." According to Thoreau we learn more of who we when we are in nature because nature has not been shaped by society, and therefore when we are in nature, and away from society's molding hands, we return to our natural selves. "For I believe that climate does thus react on man- as there is something in the mountain- air that feds the spirit and inspires. Will not man grow to greater perfection intellectually as well as physically under these influences?." When we walk, we take the time out of busy society to reflect, and according to Thoreau this self-reflection accompanied by trees, and fresh air inspires us and makes us better, spiritually, and intellectually. "Moreover, you must walk like a camel, which is said to be the only beast which ruminates when walking." Scroll Up and Get Your Copy. Henry David Thoreau (July 12, 1817 - May 6, 1862) was an American essayist, poet, philosopher, abolitionist, naturalist, tax resister, development critic, surveyor, and historian. A leading transcendentalist, Thoreau is best known for his book Walden, a reflection upon simple living in natural surroundings, and his essay Resistance to Civil Government (also known as Civil Disobedience), an argument for disobedience to an unjust state. Thoreau's books, articles, essays, journals, and poetry total over 20 volumes. Among his lasting contributions are his writings on natural history and philosophy, where he anticipated the methods and findings of ecology and environmental history, two sources of modern-day environmentalism. His literary style interweaves close natural observation, personal experience, pointed rhetoric, symbolic meanings, and historical lore, while displaying a poetic sensibility, philosophical austerity, and "Yankee" love of practical detail. He was also deeply interested in the idea of survival in the face of hostile elements, historical change, and natural decay; at the same time he advocated abandoning waste and illusion in order to discover life's true essential needs. He was a lifelong abolitionist, delivering lectures that attacked the Fugitive Slave Law while praising the writings of Wendell Phillips and defending abolitionist John Brown. Thoreau's philosophy of civil disobedience later influenced the political thoughts and actions of such notable figures as Leo Tolstoy, Mahatma Gandhi, and Martin Luther King, Jr. In 1851, Thoreau became increasingly fascinated with natural history and travel/expedition narratives. He read avidly on botany and often wrote observations on this topic into his journal. He admired William Bartram, and Charles Darwin's Voyage of the Beagle. He kept detailed observations on Concord's nature lore, recording everything from how the fruit ripened over time to the fluctuating depths of Walden Pond and the days certain birds migrated. The point of this task was to "anticipate" the seasons of nature, in his words.